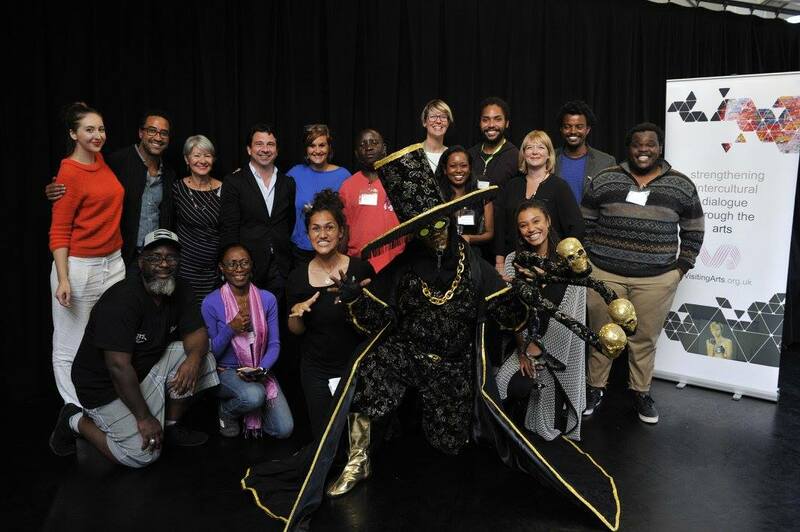 The #WCC crew including our ACPtEU rep Astrid, program hosts at #visitingarts, Yvette, Mary Helen, Sophia, Cassie, our trainers Brian, Kate and participants McArthur, Navi, George, Tesfaye, Ebonie, Patrice, Mtima, myself and Damian aka the Midnight Robber. If it weren’t for these posts I would never believe that our five day #WCC program has already come and gone here in Scotland. The participants and hosts have had such a packed week, that by now the days have all melted together into one hectic, incredible, pivotal experience which will take some time to process and unpack. Many of our colleagues have already left the city and are on their way home to Malawi, Fiji, Ethiopia, Tonga, the Solomon Islands and Trinidad and Tobago. In their suitcases I’m sure are several business cards and flyers from colleagues from all around the world. No doubt that over the next few days the #WCC participants will be emailing and tweeting furiously to their new network to further their connections and make some magic happen. Among the #WCC delegation itself, there has emerged a small kind of family, which was bound to happen after we took the time between events and venues to get to know each other and understand each other’s cultures. We are certainly all going back to our respective countries all kinds of enlightened. Personally, I now know that Ethiopians technically don’t have surnames and I can tell you where ‘Tonga’ is on a world map. Sharing and exploring so much about each other also gave us insight into ourselves, making the week a quite emotional and intense one (I wasn’t the only one who cried). All in all, I’m sure that it won’t be the last time I see these guys. If you’re shaking your head at this point, thinking to yourself that your good tax dollars paid for me to go to some festival in Scotland so I could cry and make friends, let me assure you that there’s something in it for you, too. Trinidad and Tobago boasts ‘the greatest festival in the world.’ Yet there is so much at the Edinburgh Festivals which we could learn from to better recognise and create opportunities from the cultural goldmine on which T&T sits. From a closer look at cultural spaces, to international inclusion and increased organisational sophistication, there was so much we could apply to the way we host our local events, which frankly, I can now clearly see, have the potential to grow exponentially. This feedback loop will take the form of a detailed report. Once approved and implemented, I am positive that the impact of the T&T delegation to the #edfringe2016 will be undeniable. Rochelle Amour is an independent, non-fiction writer who was part of the T&T delegation to the Edinburgh Festival Fringe 2016. She is done live-posting the event. But still follow her on Twitter @rochelleamour just cuz. Read more from Rochelle here.